Bridal Shower Themes - Co-ordination is the Key to Success! Planning and Co-ordinating all the elements of the Bridal Shower is the key to throwing a successful party! Will your choice of Bridal Shower Themes allow you to co-ordinate the following? It's great to have a really unique idea but you need to be able to match colors and the concept. Our ideas on different types of Bridal Shower Themes will help! For unusual and unique ideas for decorating your home, or designing a table centerpiece, for a Bridal Shower try adopting a specific theme. For a traditional theme use symbols or icons such as an Umbrella. Decide on the colors you would like to use for decorations to enable you to achieve a color co-ordinated theme. Choose themes which suit the season! Use white ornaments, lights and flower garlands to complement your themes and achieve a pretty effect. For a modern minimalist style think of snowflakes or stars which are a nice theme to go with a modern minimalist decor or a winter theme. Add some sparkle with some silver ornaments and decorations. Base the whole of the concept of your Bridal Shower Themes on the Kitchen or even the Beach, ideal for the bride and groom who are getting married on the beach or going abroad! Different Ideas for Bridal Shower Themes! 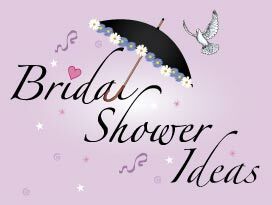 Bridal Shower Themes - Decor & Decorations! Decide on your Bridal Shower themes and color scheme and you can build all of your Bridal Shower party decorations around these ideas and themes. Balloons - You can buy plain or patterned balloons. If you are on a tight budget then blow up the balloons yourself or invest in helium balloons. If you are feeling creative draw some shapes or words on the balloons! Match the Table Decorations and Centerpiece with your theme. Be creative with a unique centerpiece. You can buy paper cups, plates and napkins but once again you can easily decorate plain white accessories with your own creative designs and characters - if you are not artistic just stick on pictures - quick and easy! Combine all of these ideas for Bridal Shower themes for a unique event and celebration! For bride to be - modern, traditional, trendy, cool or classy! Co-ordination is the Key to Success! Our selection of Bridal Shower Ideas includes our unique printable Bridal shower invitations. Top ideas for Bridal Shower Themes! Fully personalized and homemade Bridal shower invites and thank you cards are not only easy to make and print with the addition of photos but are also cheap to make!